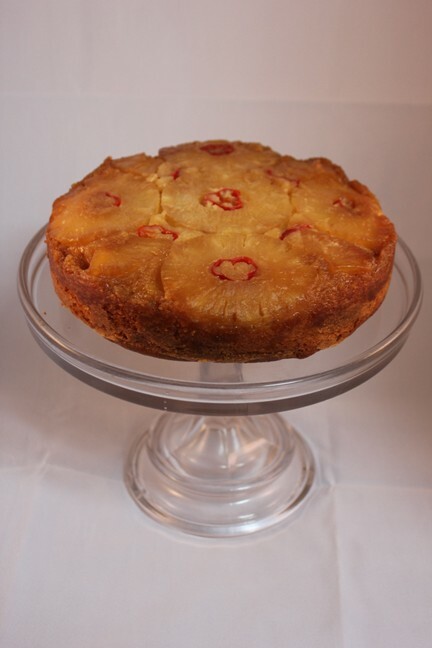 A fiery kick to an old classic cake, I had a mad half hour and decided to replace the traditional cherries in the centre of the pineapple rings atop my Pineapple Upside-Down Cake with slices of red chilli! I think it works and I love the chilli kick to the sweet cake. I dare say that this is a ‘love it or hate it’ treat so please feel free to return the cherries to their rightful place and simply enjoy this classic recipe. Be warned though, that the chilli matures over time and what was warm on day one, will be hot on day two, and WOW on day three! Line your cake tin thoroughly and stand on a baking sheet, before roughly carving the butter into the bottom of the tin. Place the tin into the preheated oven for 2 minutes or until the butter has melted. Remove the tin from the oven and scatter the sugar onto the melted butter in the cake tin. Being careful to reserve any pineapple juice in the can for later, remove any excess juice from the pineapple rings with a kitchen towel and lay them into the cake tin in a single layer, pressing into the sugar and melted butter. Chop enough rings of fresh red chilli to place a single piece in the centre of each pineapple ring and set aside. You can fill any larger gaps between pineapple rings with a smaller piece of pineapple and chilli if you like. To begin the cake, cream the butter and sugar until pale and combined. Gently whisk milk, egg, reserved pineapple juice from your can of pineapple slices, and vanilla extract in a jug. Slowly add this liquid to the butter and sugar. Combine the dry ingredients and add to the wet mixture in two halves, mixing slowly and only until completely incorporated. Pour the cake batter carefully into the cake tin on top of the pineapple and chilli. Bake for around 55 minutes, until a cake tester comes out clean. Allow the cake to cool in its tin for at least 45 minutes before turning out onto a plate to serve. The cake is delicious eaten whilst still slightly warm, with a dollop of crème fraiche and a zest of lime.